The Company has 100% ownership of mining lease 107313 on the gold-bearing Pipestone Fault in the Stock Township. 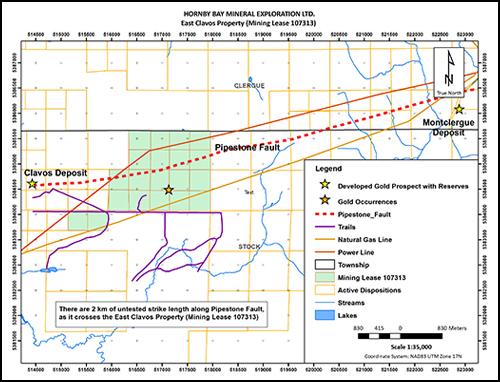 The East Clavos Property shares a common boundary with the Clavos Gold Mine Property, previously owned by Sage Gold. The Company has an active permit for drilling on mining lease 107313. 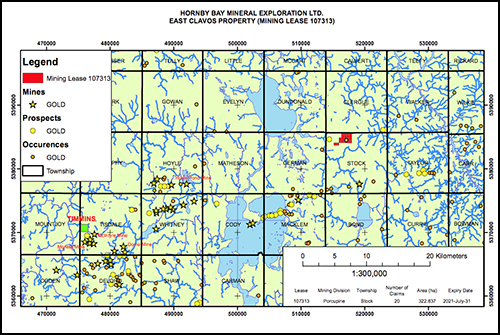 The two-kilometer-long segment of the Pipestone Fault across the East Clavos Property represents one of the last untested major gold targets in the Timmins-Porcupine gold camp.